Welcome to Affordable Learning Solutions in the CSU! Gerry Hanley discusses CSU's Affordable Learning Solutions initiative. CHOICE: Enables the discovery of course content, including commercial publisher content, library resources, and a wide array of open educational resources (OER). 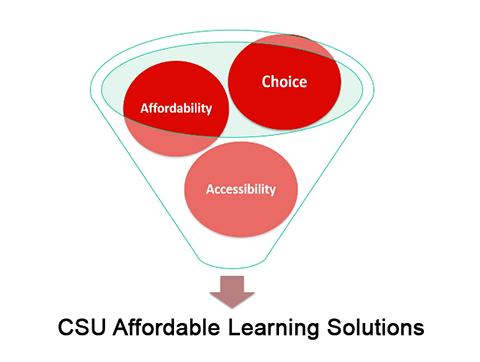 AFFORDABILITY: Technology and partnerships that reduce the cost of learning materials for students and the CSU. ACCESSIBILITY: Every student is entitled to a high quality education with access to all learning materials. Enables faculty to identify and offer quality free or low-cost course material content that can replace more costly print textbooks. Advocates for reducing the cost of course materials, to give more CSU students the ability to acquire the resources they need to be successful in their coursework thus enhancing their CSU learning experience. Supports Affordable Learning Solutions strategies and initiatives on campuses. Showcases AL$ campus programs and efforts. Now, CSU faculty and students have greater access to quality, lower or free course materials through a variety of AL$ programs and partnerships. Enables faculty to share and be recognized for best practices, quality teaching and efforts to reduce student costs by using free or low cost digital and print content in their CSU courses. Provides resources and tools to learn about, find, review and select free and lower cost course materials. Highlights AL$ campus and vendor partners. Click here for more information on the CSU AL$ Initiative Strategy.